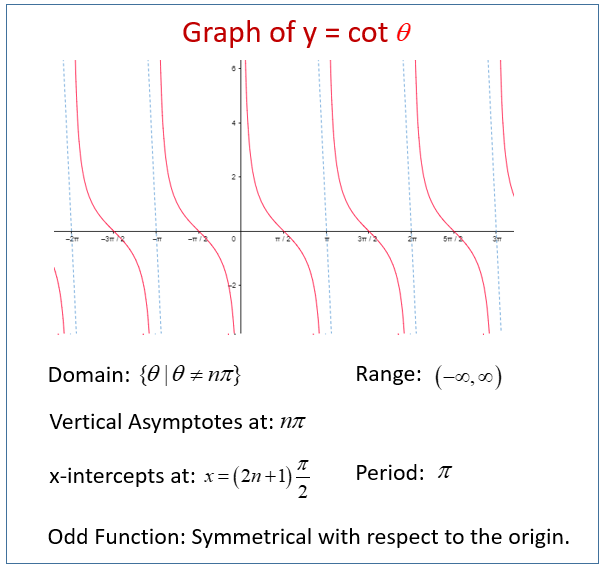 Examples, solutions, videos, worksheets, games, and activities to help Algebra 2 students learn how to graph cotangent functions. The following diagram shows the graph of the cotangent function. Scroll down the page for more examples and solutions. Determine the graph of cotangent. Determine the key properties of the cotangent graph. Illustrates the graph of the cotangent function using the cotangent segment. Determine the period of a function. This video provides an example of graphing the cotangent function with a different period and a vertical stretch. Cotangent is the reciprocal trig function of tangent function and can be defined as cot(θ) = cos(θ)/sin(θ). It is an odd function, meaning cot(−θ) = −cot(θ), and it has the property that cot(θ + π) = cot(θ). Because sine is the denominator, and the function is undefined when sin(θ) = 0, the cotangent graph has vertical asymptotes at all integer multiples of π, when sin(θ) = 0. How to graph y = tan(x) for one or more periods?